Biodiversity monitoring is criticized for being insufficiently relevant to the needs of managers and ineffective in integrating information into decision-making. We examined conservation management interventions resulting from 2½ years of monitoring by 97 rangers and 350 community volunteers over 1 million hectares of Philippine protected areas. Before this monitoring scheme was established, there was little collaboration between local people and park authorities, and park monitoring was restricted to assessments of the quantity of extracted timber. As a result of the scheme, 156 interventions were undertaken in terrestrial, marine and freshwater ecosystems. In total 98% of these interventions were meaningful and justified, 47% targeted the three most serious threats to biodiversity at the site, and 90% were implemented without external support, suggesting that the interventions were relevant and could be sustained over time at the local level. The mean time from sampling to decision-making was only 97 days, probably because 82% of the interventions were initiated by the same people and institutions that had compiled the underlying data, bypassing potential government bureaucracy. Many of the interventions were jointly undertaken by community members and the management authorities or consisted of local bylaws in support of park management. As a result of the monitoring, indigenous resource use regulation schemes were re-established with government recognition in several parks. The monitoring led to more diversified and realistic management responses on the part of the authorities, including a more socially acceptable and effective approach to enforcement. Of the four field monitoring techniques used, the most participatory one generated more interventions aimed at ensuring a continued resource supply for local communities (χ23 = 69.1, p <0.01). 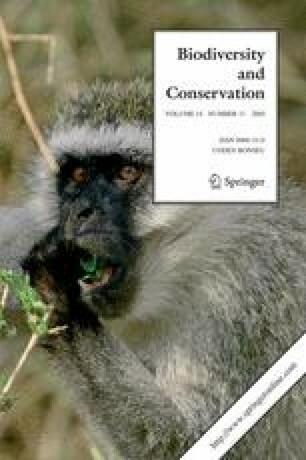 Although this suggests that the interest of community members is associated with their possibilities to influence the flow of ecosystem goods and services, the 156 interventions targeted, directly or indirectly, all known globally threatened species of mammals, birds and butterflies in the parks.